Though late to the game, East Coast states are poised for a major expansion into wind power - and to benefit from the jobs that come with it. Block Island offshore wind farm aerial view (Source: Wikipedia (Ionna22/CC BY-SA 4.0)). There’s no question the U.S. is a latecomer to offshore wind. Just look at the numbers. In U.S. waters, there are precisely five turbines. They’re just off Block Island, Rhode Island, churning out 30 megawatts since late 2016. In the rest of the world – mainly Europe – offshore wind is 20 years old and now represents more than 18,800 megawatts. But the U.S. is poised catch up, and quickly. In the face of climate change and the retirement of nuclear, coal, and oil power plants, offshore wind is shaping up to be a renewable power of choice. Unlike solar power or onshore wind, which produce electricity only when the sun shines or the wind blows, offshore wind turbines turn all the time, though at variable speeds. And they can supply large quantities of electricity – enough to replace a nuclear plant. Developers have purchased about a dozen wind energy areas in federal waters from Maine to the Carolinas, enough to support about 17,000 megawatts of wind power. And thanks to a bit of inter-state can-you-top-this competition that has ratcheted up mandates for offshore wind in several states, plus a few contracts already awarded, about half that total capacity could be up and running by the early 2020s. The American foray into offshore wind couldn’t have been less auspicious. An ambitious project called Cape Wind – 130 turbines off Cape Cod in eyeshot of some well-connected families, including the Kennedys and the Koch brothers – failed famously and officially earlier this year after 17 years of fighting, legal and otherwise. But a federal push for offshore wind, begun during the George W. Bush administration and intensified during the Obama administration, so far has been sustained by the Trump administration. The Bureau of Ocean Energy Management is readying more lease sales of tracts off Massachusetts for late this year, has been exploring increases off New York and New Jersey, and has been holding public sessions aimed at identifying new areas in the Atlantic that could support wind power. Efforts off the West Coast are also slated to get underway late this year. There are several factors driving the potential of the U.S. offshore wind industry, not the least of which is that the area off the northeast coast of the U.S. is considered one of the best, if not the best, in the world for wind energy. It’s windy. It’s relatively shallow. Much of the adjacent land areas support large population centers in need of additional sources of electricity. And several northeast states have set ambitious renewable energy requirements. But among the biggest factors setting the stage for offshore wind growth may well be the cost – down a hefty 50 percent since Europe began installing it. Turbines are also rapidly increasing in size and efficiency. “People sit up and take notice when they see it’s become more cost-effective, and I think that can never, ever, ever, ever be understated in terms of the role that that’s played,” said McClellan, who along with many others said that the U.S. foot-dragging on offshore wind may have turned out to be lucky. She and others also said that the Block Island project, as small as it is, made a big impression. “The effect that that had for policymakers to say – ‘huh – OK – that didn’t get shut down.’ It got built and people love that project,” she said. But what many think has been key is individual states putting policy backbones in place to mandate the creation and adoption of offshore wind power. In addition to helping states meet environmental goals, those policies are expected to create jobs. A group of studies by the Clean Energy States Alliance last year determined that 8,000 megawatts of offshore wind in the northeast by 2030 would translate in 40,000 direct and indirect jobs. “Having these policies in place really signals to investors, to developers, to the supply chain that this is an industry that has serious momentum behind it and that there’s commitment to its growth,” Sopko said. Massachusetts was the first state to really figure all that out and then act on it. But what many believe was the most decisive risk the state has taken was 2016 legislation mandating the state purchase 1,600 megawatts of offshore wind by 2027. No state had ever done that. That legislation started a scramble throughout the northeast for a piece of the anticipated business in federal lease areas. New York followed with a mandate for 2,400 megawatts by 2030 and a master plan for how to do it. New Jersey, which had put offshore wind policy in place when Republican Chris Christie was governor but then did nothing for eight years, added a 3,500-megawatt mandate by 2035 almost immediately after Democratic Gov. Phil Murphy came into office in January 2018. This summer, Massachusetts doubled the amount of offshore wind it’s seeking by 2035 – to 3,200 megawatts – although that’s less than the 5,000 megawatts state Sen. Marc Pacheco had proposed. “If we want to do our part in trying to alleviate the worst effects of global climate change and do it in way that will be the best deal for the ratepayers, it is by taking advantage of as much offshore wind as you can as quickly as you can,” said Pacheco, the founding chair of the Senate Committee on Global Warming and Climate Change. This spring, the first contracts for wind projects were approved in lease areas off New England. Massachusetts okayed an 800-megawatt installation by Vineyard Wind, a partnership of Copenhagen Infrastructure Partners and the energy company Avangrid. Just-announced rates are even lower than anticipated – competitive with hydro and poised to push electricity rates lower, not higher. In June, Connecticut announced it would join a 400-megawatt project already approved by Rhode Island, adding its own 200 megawatts to an installation planned for a lease area owned by Deepwater Wind, the company that built the Block Island project. By combining projects, the two small states were able to obtain a lower price that comes from buying in bulk. Deepwater Wind also has smaller projects planned: South Fork Wind Farm, to bring 90 megawatts to eastern Long Island, and Skipjack, a 120-megawatt project off Maryland. Both New York and New Jersey expect to have requests for proposals for wind projects out by the end of this year – about 800 megawatts for New York and 1,100 megawatts for New Jersey. Both come with a bit of urgency. “New Jersey is kind of playing catch-up,” said Joseph L. Fiordaliso, president of the New Jersey Board of Public Utilities. The state is hiring a consultant to do an offshore wind strategic plan. But as to the question of whether Christie may have inadvertently done the state a favor by sitting on offshore wind action for so long while prices fell: “By the same token, we lost eight years,” Fiordaliso said. Even though the U.S. is 20 years behind Europe in offshore wind development, Alicia Barton, president and CEO of the New York State Energy Research and Development Authority, NYSERDA, doesn’t think New York or any other state is at a disadvantage. She speaks from perhaps more experience than most, having run the Massachusetts Clean Energy Center during much of the Cape Wind effort and the initial development of that state’s current offshore wind industry. But the paths forward can still be difficult. 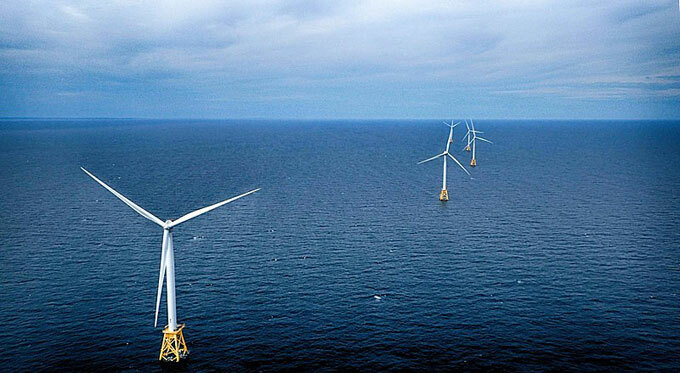 Maryland passed an offshore wind energy act in 2013 that added a small carve-out for offshore wind to the state’s renewable energy requirement. Maryland approved Skipjack and another project last year, but shoreline interests have been less than enthusiastic about them and the potential impact on vacation and recreation areas. Many insist that offshore wind, more than other renewable energy options, enjoys bipartisan support. But experiences in New Jersey as well as Maine, where environmental advocates are waiting out the administration of term-limited Republican Gov. Paul LePage, would suggest otherwise. Aside from the political will to build offshore wind, a host of technical issues remain – among them questions about transmission and shipping regulations related to parts coming from Europe. But others say it’s fishing interests that may present the most gnarly problem. Ask Bonnie Brady, executive director of the Long Island Commercial Fishing Association, if she thinks her industry’s concerns are being addressed adequately: “No, absolutely not,” she says. More than a few offshore wind proponents and developers admit this is a group that needs to be included more prominently in decision-making. NYSERDA’s Barton, seasoned as she is from the Cape Wind battles, knows to take the fishing concerns and concerns of others seriously. “We know that for offshore wind to be successful for our state, it has to be done in the right way to avoid those adverse impacts,” she said. But could it go off the rails completely?